The government released for the first time comprehensive data (Mexico Segob homicide database) on killings related to organized crime. Ministry of Government spokesman Alejandro Poiré said the disclosure was “an exercise of transparency without precedent in Mexico, and with few precedents in the world.” The database includes killings month by month from December 2006 (when Felipe Calderón took office) through December 2010 for more than 1,100 municipalities across the country. On a quarterly basis, the peak was 2Q and 3Q 2010. The rate of killings was down 10% in 4Q10, though the government was unwilling to say this was the beginning of a trend. 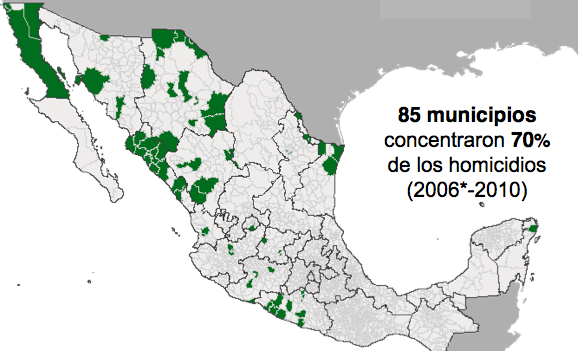 Since December 2006, 70% of the killings have been concentrated in just 85 municipalities, concentrated along the U.S. border and the Pacific coast. This entry was posted in Drug wars, Government, Justice, Military. Bookmark the permalink.